It's not "Deck the halls with boughs of holly." 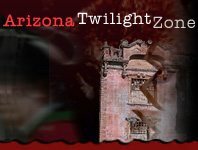 During the Halloween season in Arizona, you can find Halloween enthusiasts decking their halls with Halloween wonder and in many cases horror. See things that will shock you and chill you, including animatronic props set to a horror genre, skeletons, sites of graves, dead heads hanging, terrorifying looking clowns, and many other sights that may continue to haunt you in your dreams.